When a misfire occurs, engine speed will fluctuate. If the engine speed fluctuates enough to cause the crankshaft position (CKP) sensor (POS) signal to vary, ECM can determine that a misfire is occurring. The misfire detection logic consists of the following two conditions. One Trip Detection Logic (Three Way Catalyst Damage) On the 1st trip, when a misfire condition occurs that can damage the three way catalyst (TWC) due to overheating, the MIL will blink. When a misfire condition occurs, the ECM monitors the CKP sensor signal every 200 engine revolutions for a change. When the misfire condition decreases to a level that will not damage the TWC, the MIL will turn off. If another misfire condition occurs that can damage the TWC on a second trip, the MIL will blink. When the misfire condition decreases to a level that will not damage the TWC, the MIL will remain on. If another misfire condition occurs that can damage the TWC, the MIL will begin to blink again. Two Trip Detection Logic (Exhaust quality deterioration) For misfire conditions that will not damage the TWC (but will affect vehicle emissions), the MIL will only light when the misfire is detected on a second trip. During this condition, the ECM monitors the CKP sensor signal every 1,000 engine revolutions. A misfire malfunction can be detected on any one cylinder or on multiple cylinders. P0300 MULTI CYL MISFIRE (Random/Multiple cylinder misfire detected) Multiple cylinder misfire. P0301 CYL 1 MISFIRE (Cylinder 1 misfire detected) No. 1 cylinder misfires. P0302 CYL 2 MISFIRE (Cylinder 2 misfire detected) No. 2 cylinder misfires. P0303 CYL 3 MISFIRE (Cylinder 3 misfire detected) No. 3 cylinder misfires. P0304 CYL 4 MISFIRE (Cylinder 4 misfire detected) No. 4 cylinder misfires. Is 1st trip DTC detected? YES >> Proceed to EC-270, "Diagnosis Procedure". Start engine and drive the vehicle as per the similar conditions to (1st trip) Freeze Frame Data for a certain time. Refer to the table below. The similar conditions to (1st trip) Freeze Frame Data means the vehicle operation that the following conditions should be satisfied at the same time. Always drive vehicle in safe manner according to traffic conditions and obey all traffic laws when driving. Engine coolant temperature (T) condition When the freeze frame data shows lower than 70В°C (158В°F), T should be lower than 70В°C (158В°F). When the freeze frame data shows higher than or equal to 70В°C (158В°F), T should be higher than or equal to 70В°C (158В°F). The time to driving varies according to the engine speed in the freeze frame data. Is 1st trip DTC detected? YES >> Proceed to EC-270, "Diagnosis Procedure". Start engine and run it at idle speed. Listen for the sound of the intake air leak. Is intake air leak detected? YES >> Discover air leak location and repair. Stop engine and visually check exhaust tube, three way catalyst and muffler for dents. Is the inspection result normal? YES-1 ( With CONSULT)>>GO TO 3. YES-2 ( Without CONSULT)>>GO TO 4. NO >> Repair or replace it. Make sure that each circuit produces a momentary engine speed drop. Start engine and let engine idle. NO >> Perform trouble diagnosis for FUEL INJECTOR. Refer to EC-450, "Diagnosis Procedure". Do the following procedure in the place where ventilation is good without the combustible. Remove fuel pump fuse in IPDM E/R to release fuel pressure. Do not use CONSULT to release fuel pressure, or fuel pressure applies again during the following procedure. After engine stalls, crank it two or three times to release all fuel pressure. Remove all ignition coil harness connectors to avoid the electrical discharge from the ignition coils. Remove ignition coil and spark plug of the cylinder to be checked. Crank engine for 5 seconds or more to remove combustion gas in the cylinder. Connect spark plug and harness connector to ignition coil. Fix ignition coil using a rope etc. 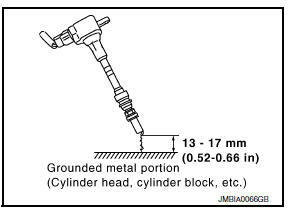 with gap of 13 - 17 mm (0.52 - 0.66 in) between the edge of the spark plug and grounded metal portion as shown in the figure. Crank engine for about 3 seconds, and check whether spark is generated between the spark plug and the grounded metal portion. Do not approach to the spark plug and the ignition coil within 50 cm (19.7 in). Be careful not to get an electrical shock while checking, because the electrical discharge voltage becomes 20 kV or more. It might cause to damage the ignition coil if the gap of more than 17 mm (0.66 in) is taken. When the gap is less than 13 mm (0.52 in), the spark might be generated even if the coil is malfunctioning. Disconnect spark plug and connect a known-good spark plug. Crank engine for about 3 seconds, and recheck whether spark is generated between the spark plug and the grounded metal portion. NO >> Check ignition coil, power transistor and their circuits. Refer to EC-456, "Diagnosis Procedure". Check the initial spark plug for fouling, etc. Refer to EM-45, "Removal and Installation". Is the inspection result normal? YES >> Replace spark plug(s) with standard type one(s). For spark plug type, refer to EM-118, "Spark Plug". NO >> 1. Repair or clean spark plug. Reconnect the initial spark plugs. Refer to EM-45, "Removal and Installation". Crank engine for about 3 seconds, and recheck whether spark is generated between the spark plug and the grounded portion. NO >> Replace spark plug(s) with standard type one(s). For spark plug type. Refer to EM-118, "Spark Plug". Check compression pressure. Refer to EM-23, "Inspection". NO >> Check pistons, piston rings, valves, valve seats and cylinder head gaskets. Refer to EM-112, "Description". Release fuel pressure to zero. Refer to EC-143, "Work Procedure". Install fuel pressure gauge and check fuel pressure. Refer to EC-143, "Work Procedure". Is the inspection result normal? YES >> GO TO 12. Check fuel hoses and fuel tubes for clogging. Is the inspection result normal? YES >> Replace вЂњfuel filter and fuel pump assemblyвЂќ. Refer to FL-6, "Exploded View". Check ignition timing. Refer to EC-480, "Inspection". Is the inspection result normal? YES >> GO TO 13. NO >> Perform вЂњBASIC INSPECTIONвЂќ. Refer to EC-131, "Work Procedure". Check the continuity between A/F sensor 1 harness connector or ECM harness connector and ground. Is the inspection result normal? YES >> GO TO 14. Check the A/F sensor 1 heater. Refer to EC-177, "Component Inspection (A/F Sensor 1 Heater)". NO >> Replace A/F sensor 1. Refer to EM-30, "Exploded View". Check вЂњMASS AIRFLOWвЂќ in вЂњDATA MONITORвЂќ mode of вЂњENGINEвЂќ using CONSULT. Specification : EC-486, "Mass Air Flow Sensor"
Check mass air flow sensor signal in Service $01 with GST. Is the measurement value within the specification? YES >> GO TO 16. NO >> Check connectors for rusted terminals or loose connections in the mass air flow sensor circuit or ground. Refer to EC-186, "DTC Logic". Check items on the rough idle symptom in EC-473, "Symptom Table". Some tests may cause a 1st trip DTC to be set. Erase the 1st trip DTC from the ECM memory after performing the tests. Refer to EC-55, "Diagnosis Description".